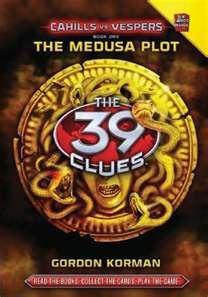 Frankly, I was pretty disappointed in this book; however, I have not read the original 39 Clues series (I’ve since read the first). I thought this was it, but after a few pages it became obvious I had missed something. There were lots of references to prior adventures and a search for the ingredients of a secret super serum. The back story sounds exciting. I still plan to read it. But the fact remains, I didn’t really like this one. The books starts out with immediate action. Multiple kidnappings of various members of the Cahill family occur at exactly the same moment all around the world. Shortly after, teenage brother and sister Dan and Amy Cahill receive a mysterious phone over which a series of text demands are made. Follow the instructions, or the Vespers will pick off the hostages one by one. But who are the Vespers? And what do they really want now that the serum recipe has been destroyed? A series of adventures, including the theft of a world-famous masterpiece out of a busy Italian museum, shed very little light on the mysterious secret organization, but Dan and Amy are determined to find out. And to fight back. Unfortunately, when their tasks are completed, Vesper One betrays them. At the end of the book, the kids are off to Switzerland, and their relatives are still captive. The Medusa Plot is definitely a kid-friendly book. There’s a lot of high-action adventure, there’s a code in the page numbering of the book, there’s an interactive website and collector cards as well. (There’s even a whole new spin-off series of 99 cent short ebooks called Rapid Fire.) But while the story has excitement, it has little else. The writing is bland, the humor falls flat, and I just didn’t develop any rapport with the characters. I began to not hate it about five chapters from the end. Perhaps I would have felt differently if I’d navigated prior adventures with the Cahill clan. As it is, the book simply feels like a quick money-generator that has sacrificed all the best elements of children’s literature. What a letdown. I am sorry that you didn’t like this book. One thing I do agree with you is that they have to be read in order even though they are supposed to be able to be read out of order (they really can’t be). The online game and the clue hunt are also big parts of the whole thing. I also agree that it isn’t a “great literature” book like Redwall or Jules Verne, but just a modern, fun kind of thing for kids. Ha, ha! The last time I played a video game was, seriously, probably 1998. I’ll leave the games to you. 🙂 Have fun!